Laurier alumnus John Morris pictured with his mixed doubles curling teammate Kaitlyn Lawes. He came out on top as a member of the Canadian men's curling team at the 2010 Winter Games in Vancouver. 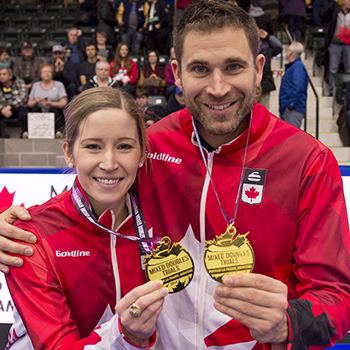 Now, Wilfrid Laurier University alumnus John Morris is aiming to strike gold a second time as part of Canada's first-ever mixed doubles Olympic curling team. Morris will take to the ice with teammate Kaitlyn Lawes during the 2018 Winter Games in Pyeongchang, South Korea, where mixed doubles will make its Olympic debut. Like Morris, Lawes is a past gold medallist, winning as a member of the Canadian women's curling team at the 2014 Winter Games in Sochi, Russia. "Mixed doubles has really started thriving all over the world – it's huge internationally," says Morris. "I was lucky and privileged enough to compete at the Olympics in men's curling and now I have the opportunity to get there in mixed doubles. I'm absolutely thrilled." Morris and Lawes qualified for the Games in January, defeating Val Sweeting and Brad Gushue in the final of the Canadian mixed doubles curling trials in Portage la Prairie, Manitoba. Morris says competing at a second Winter Olympics is the continuation of a two-decade dream, one that began when he watched Canadian curling rinks led by Mike Harris and Sandra Schmirler compete at the Nagano Winter Games in 1998. "I was just starting university at the time and I remember thinking 'this is something I want to get into one day,'" says Morris. "In the back of my mind that was my goal. I said: 'I'm going to continue at this game and I want to get to the Olympics one day.' Working hard and finally realizing that goal in 2010 was a dream come true." While he's been to the Olympics before, Morris says he's still experiencing some nerves ahead of the Games. Mostly, though, he's excited about competing for Canada and says he can't wait to get to South Korea. "Nothing gets me more fired up than putting that maple leaf on and having the chance to represent this great country," says Morris. "I think it's only human to get a little nervous, but it's more of an excitement and a bit of anxiousness to get started. We're Canadian and we're curlers – and we're going there to win gold." Morris is among three Laurier graduates who will be a part of the Canadian curling contingent in Pyeongchang. Laurier alumnus Brent Laing will compete as part of the Canadian men's team, Team Koe, while alumnus Paul Webster is again serving as Canada's Olympic team leader for curling. Laing, who Morris refers to as "Lainger," shares a bond with Morris that goes back to their days as junior teammates, when they twice won the World Junior Championships together. The pair also curled together as Golden Hawks and were roommates for close to three years while in university. "Lainger is probably the main reason I went to Laurier," says Morris. "We played together in juniors when we were both in high school. He was one year ahead of me, applied to Laurier and got in. I remember talking with him when I was back in Ottawa still finishing my high school and he was saying how great the school was." Morris, who would go on to spend four years as a member of the Golden Hawks men's curling team, says Laurier provided the perfect environment to pursue his degree in kinesiology and improve his game. "At the time, we were competing on the World Curling Tour, we were competing for World Junior Championships, so we had a lot going on outside of school," says Morris. "But Laurier was so supportive of our endeavours and us trying to win a world championship for Canada. It was just a really great environment, just great people." Morris says it will be a special experience to share the Olympics with Laing, who was one of the first people to send Morris a message after he and Lawes qualified for the Games in January. "When you go to the Olympics, that Canadian team and that experience you share, it's something I've never felt before," says Morris. "It's what makes the Games so amazing – the friendship, the spirit and the camaraderie we have as Canadians." It was a serendipitous series of events that led Morris to qualify for his second Winter Games. Until recently, he had been playing on a mixed doubles team with Rachel Homan, whose women's team won December's Canadian trials to earn a berth in Pyeongchang. Because rules state that if you win a team event to qualify for the Olympics you can no longer participate in mixed doubles, Homan was unavailable to play with Morris. Enter Lawes, who was not scheduled to play in January's mixed doubles trials. "I lost my partner three weeks before the mixed doubles trials and it was just sort of by sheer luck that Kaitlyn was still available," says Morris. "For me, it was a no-brainer. Kaitlyn and I had played together before, she has a really good skill set and she's a competitor – she has a great drive to win. So I called her up and we clicked pretty instantly, but what we hadn't done is curl together a lot. We got together for a quick practice in Winnipeg just before the trials and we really had to learn on the fly how to play well together." With Lawes living in Winnipeg and Morris in Calgary, there hasn't been a lot of time for team practice, but the duo hit the ice together at the Kitchener-Waterloo Granite Club for two days of practice in late January. After that, it's off to South Korea. "I'm really excited for the Games because mixed doubles is the first seven days and I have the next two weeks off," says Morris. "I'll be sporting that maple leaf loud and proud and I'll be in the stands cheering on Koe and Homan's teams and the rest of our Canadian athletes. I just can't wait." The Winter Olympics take place in Pyeongchang, South Korea, from Feb. 9 to Feb. 25. The mixed doubles curling competition runs until Feb. 13.